If you’re a dyed-in-the-wool Trekkie like Your Old Uncle Rod, I know you’ve dreamed of sitting in that fabled Captain’s Chair on the bridge of the Enterprise and having the whole galaxy at your fingertips. Until recently, that was just a dream. Well, OK, it’s still a dream, but it’s been fulfilled in a small way by the Denkmeier SCT Powerswitch diagonal with Filter Switch. The whatsit with the whosit? 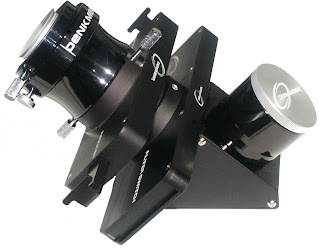 I hope you’ve heard of Denkmeier Optical’s SCT Powerswitch diagonal (aka the "S1"). It’s been around for a few years, and has already done a lot to bring the Federation Starship experience to the SCT. Picture this: you’re sitting at your Meade or Celestron GPS scope set up in alt-az mode. You’re comfortable, you’ve got the HC in one hand and a nice, err, “beverage” in the other. You can send your scope to any object of your desire at the push of a button—better set that brew down, first, though, Skeezix. Thanks to the SCT Powerswitch diagonal you can also place a 2x Barlow or a focal reducer in the light path at the push of a, well, switch. Yeah, you’re really cruising the deep sky now. NO more fumbling around with eyepieces, diagonals and visual backs. But imagine there’s another pair of switches on the Powerswitch. Not only can you change magnification, you can insert either of two filters with a flick of the wrist. You don't have to get up from your Captain's Chair to do it, either. And you know how it is with filters: when you finally find the dang thing in the accessory box, you manage to drop it into the horse-poop laden dust at Prude ranch before you can get it on an eyepiece (why do filters that are so easy to screw-on in the daylight refuse to thread onto an eyepiece in the dark?). Heck, if you could put an LPR filter (or any other kind of filter) in the light path without all that messing around, you might actually use those little pieces of glass you paid so much money for. Well, now you can Pards, now you can. The Denkmeier folks have added an integral filter slide/drawer to the Powerswitch diagonals, the “Filter Switch.” As seen in the pic, the P'switch now offers dual filter control in addition to the Barlow, reducer, and high-class diagonal of the original outfit. Yep. When the skies were clear, anyway. Maybe even when they weren’t. Thanks to the hospitality of the good folks at the just-finished Almost Heaven Star Party way up yonder in West Virginia, I thoroughly enjoyed myself even when all I could see was the underside of clouds (or the insides of my eyelids). There was also the blessedly cool weather—I’m talking jacket weather at night, muchachos—what a welcome relief from the “Expect a heat index of 112 today” Weather Channel reports I keep hearing in the Swamp. When I arrived at the AHSP’s Mountain Institute facility site on top of Spruce Knob Mountain (not far from Circleville, West Virginia, about 4 hours from DC's Dulles airport), I could tell it was gonna be a nice weekend. While the trip up from Possum Swamp was not an easy one due to the tender mercies of what passes for our airline industry (ever been REVERSE screened? ), the good folks of NOVAC and VOLT, the star party's two organizing entities, made made me feel at home right away. They had also made my journey a little less arduous than it would otherwise have been, arranging a ride up from Dulles that saved me from an intimidating drive (thanks AGAIN Lyle). What’s observing from the top of a mountain like? While the site is hilly, as you’d expect (! ), there was plenty of room for over 150 excited observers and their scopes, which ranged down in aperture from 25-inches, and included some purty danged serious hardware. The “what else” that makes this a great star party site is what makes any star party great: facilities. I don’t care HOW dad-blamed good your skies are, if your “facilities” consist of two porta-potties and a picnic table or three, don’t expect success. 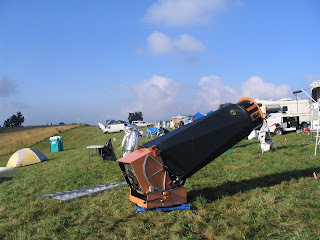 Other than observing, what do most of us look forward to doin' at a star party? BUYIN' ASTRO STUFF, of course! For those of us without a nearby dealership, being able to actually examine the merchandise before buying is a rare treat. This year, two outstanding dealers were present at AHSP, long-time astro-biz fixture Gary Hand (Hands on Optics), and a newer outfit, Astrogizmos, who specialize in interesting and useful accessories. Naturally, your ol' Uncle couldn't resist opening his moth-eaten wallet a time or two. But who am I kidding? I know that no matter what I say about the everything-else, you little birds are wanting to know just one thing: HOW WERE THE SKIES? Thursday night was (I was told) pretty much a washout. Friday night? A few minutes in the early evening and a few minutes in the late evening/early morning. Saturday, though? Hoo boy! I am not exaggerating when I say I have never, ever seen better skies east of the Mississippi. Equipped with a pair of Celestron 10x50 binocs I’d brought along and a loaner Celestron C6 SCT, I was in deep sky heaven. The Milky Way from Sagittarius to Cassiopeia was a wonderland, stretching from horizon to horizon like some great, burning rainbow. Marvel after marvel fell to my binocs, the C6, and the many scopes whose owners graciously let Your Old Uncle take a peep. Examples? When was the last time you saw, really saw, M101 in a pair of 10x50s? How about M110? Or were honestly able to call The Eagle's (M16's) nebulosity "bright"—in a 6-inch scope? Suffice to say, I sucked-in sky for as long as I dared. If anything, my trip back would be even more punishing for someone of my—ahem—“advanced age.” So at 1 in the a.m., unsated, it was back to the yurt, a draught of 'Yell, and let's-call-it-a-night for me. I’m sure my down-home manner puzzled some of the good AHSP folks and irritated plenty of others, so I definitely appreciate ‘em not only putting up with me for a long weekend, but just being so darned nice.